I have been (not so) patiently waiting for this beer to hit shelves in New York since it last left shelves. Shandy season is my favorite time of year….and there’s good reason for it. I. Love. Summer Shandy. In fact, I love it so much that I am willing to pay the exorbitant six-pack prices here in New York. And…on to the review! So…what is shandy? Shandy is the term for beer mixed with lemonade. 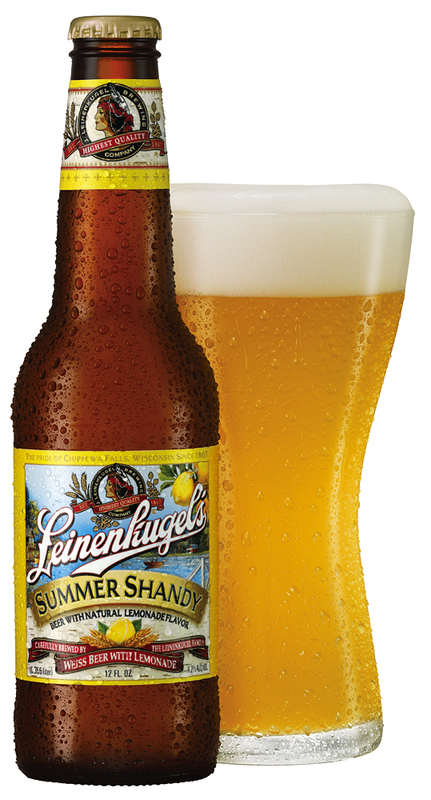 If you took Leinie’s Honey Weiss and mixed it with lemonade, you’d get Summer Shandy. Leinie’s calls it “the perfect summer refresher” and I completely agree. After a hot day of laying on the beach or sitting out on the balcony reading, all I want is one of these. Summer Shandy is light, crisp, and very citrusy. You can tell it’s brewed with lemonade just by smelling it. It has a lovely golden color and pours fairly clear with a decent head. I could drink this beer for days. Literally, ’cause it’s only 4.2% ABV. It is not bitter at all, so for those of you who don’t like the taste of hops, this is a good one for you. Now, maybe this beer technically isn’t worth five stars, but this is MY blog and this is one of MY favorite beers, so take that, arbitrary rating system. Thanks for the comment! I tried a mix of beer and Coke when I was in Germany about 8 years ago (I forget what they called it.) I would love to try other shandies but they aren’t very popular in America. Any recommendations for ones I could attempt to find? Or ones to try whenever I get back to Germany? As you can see from the review I’m a huge fan of Leinie’s, but I know it’s not that great of beer. However, it’s cheap and usually tastes pretty good, which is more than you can say for most cheap beer in America. My daughter’s name is Shandi. Can you tell me if we can buy this in Louisiana? Summer Shandy should be available in all 50 states! It is usually released by April or May and sticks around until August or September.